White ceilings are standard, but you reap great design rewards with a colored ceiling. Colored ceilings add depth and warmth and are great solutions for ceiling design challenges. You can visually lower or raise the ceiling height with color. Light colors give the illusion of expansion while dark colors visually contract and bring closer. Warm colors will visually lower a ceiling. The color range includes brown, red, orange, yellow, green and teal. Cool colors will visually raise a ceiling. The cool color range includes black, gray, pink, purple, blue, blue-green, emerald. The color wrap technique is one approach to colored ceilings. It involves painting the ceiling the same color as the walls. While vaulted ceilings make a wow design statement, they can give a cold, indifferent feel to the décor. The color wrap technique can help counter this, as it can help make any room a bit cozier and warmer. The lack of contrast between the walls, molding and ceiling leads to the visual effect of a lower ceiling. Color wrapping is especially effective if your room has uneven wall heights, often found in attics, that create oddly angled walls. 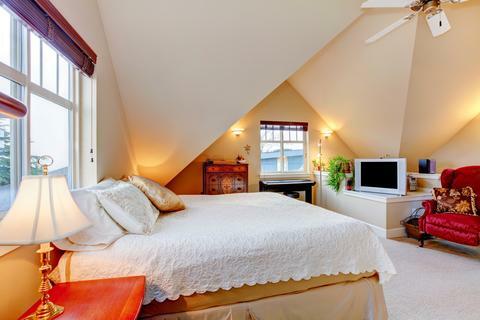 Uneven walls that create odd ceiling heights, such as an attic with dormer windows, benefit greatly from this technique. By using the same color for walls and ceiling, the sharp angles and odd shapes are visually softened. The harshness that uneven ceiling heights give a room are no longer the primary focus, allowing the décor to take center stage. Basement ceilings often have ductwork and other kinds of enclosed mechanical obstacles. You can apply the same design trick used in attics by painting these, along with rest of the ceiling, the same color as the walls. This will change the visual focus from the ceiling to the décor. One color technique for ceilings is to select a coordinating color that is lighter than the wall color. This technique is great for smaller rooms. To choose appropriate tones, use color gradient paint chips that show the color progression of one hue. To select the ceiling color, move to the second or third color chip that's lighter than the one you used for the walls. You can visually lower a ceiling by painting it a darker color value than the walls. The darker the color, the more dramatic the effect of a lower ceiling. To select a coordinating tone, use color gradient paint chips and select a color that is one or more steps darker than your wall color. For a striking décor, choose a ceiling color that contrasts the wall color. This design technique creates a cozy and intimate space. Paint the ceiling the complementary color that contrasts well with the wall color. The secondary color used in your color scheme is an excellent choice. Use a rug the same color as the ceiling to create a mirroring effect. Not all ceilings are flat surfaces. Consider these techniques if you have a tray or coffered ceiling. Single tray: A single tray ceiling can be highlighted by using a color darker than the wall. Multiple trays: If your tray ceiling has more than one tray, you can use different colors for the trays and moldings. Coffered: To highlight the beam patterns of a coffered ceiling, you can use a single color or a combination of colors. 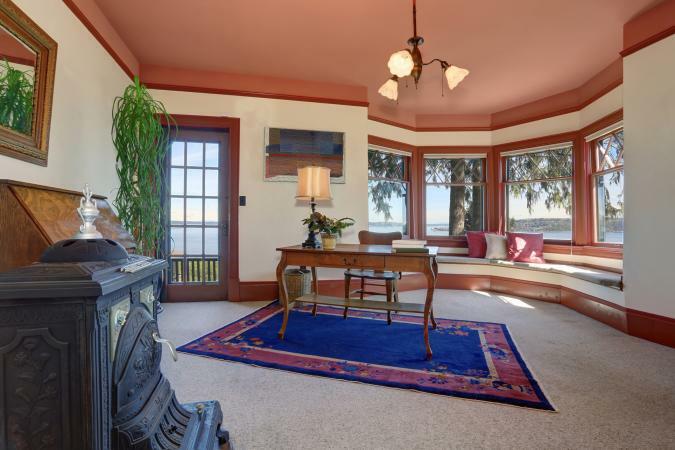 Reflective ceilings: Use a satin sheen paint or a coat of same-color glaze to introduce reflective properties. Ceiling imperfections: The higher the paint sheen, the more visible surface imperfections will be. 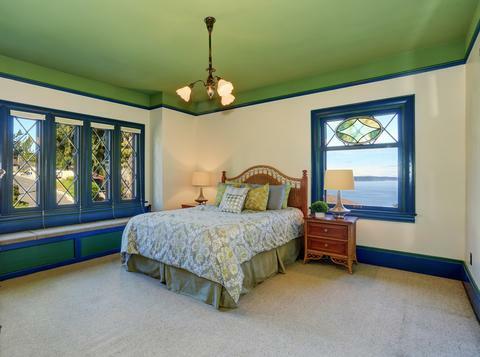 Define ceiling: Same-color walls and ceilings can be highlighted further by painting the molding white. Stenciled ceilings: Create a wow-factor ceiling by using a stencil. You can transform any room by updating a white ceiling with a colorful coat of paint. Be sure the color you select goes with your existing décor to reap a cozy ambience.